The beginning starts out nice and dark & gloomy like some of Burton’s other treasured horror films, but soon takes a lighter turn as many old Dark Shadows fans were unhappy about. The movie did NOT however turn out to be as tongue-in-cheek as the trailer showed. Honestly, most of the jokes in the movie are IN the trailer which took away a bit from the humor in the movie since all of the jokes had already been heard before. That being said, the jokes were distributed throughout the movie at a well-balanced pace rather than bam, bam, bam as the trailer showed. I think they created the trailer as such in order to bring in a younger audience since that’s where a lot of movies get their sales. While watching the movie I had several moments where I was reminded of another of Burton’s movies, Beetlejuice, and a non-Burton film, Death Becomes Her. The scenes that reminded me a lot of Death Becomes Her were due to a bit of excess “cheese” in the movie, but still amused me to a point. A few things seemed a bit overboard for the movie, but since I’m more forgiving than a lot of movie goers & definitely the cult Dark Shadows fans, I laughed them off as just a bit of Burton’s overzealous personality. There were a few moments in the movie that I also found a bit slow, but not so slow as I was nodding off as I have done in many other movies. This one held my attention all throughout. The only thing I had wished I had done different was to have started watching the old Dark Shadows series earlier than I did in order to follow some things a bit better. Well, maybe not follow so much as to understand some of the various connections. I watched the old show some as a little girl with my older brother, but don’t remember anything from that time really. I have recently started the series from the beginning, but haven’t even gotten to where Barnabus comes in so really didn’t know who a couple of the characters were and was thrown off in the beginning with the timeframe of when Vickie Winters came to town, the ages of David & Caroline, and also due to the fact that Vickie’s actual name in the movie was Maggie Evans, though I think the latter was just a homage Burton must’ve added in to another great character from the old show. Hopefully I will discover more hidden homages and such as I get further into the TV series and then re-watch this movie on DVD once it comes out. I have read comments from others regarding the movie saying it sucked and someone even mentioned giving up on Johnny Depp after this one. Everyone has a right to their own decision, but just because I liked a couple of Johnny’s movies less than some of his others doesn’t mean I’ll give up on them. Honestly, I’m not sure I’m going to like Johnny’s next movie, The Lone Ranger, but I’m still going to watch it. It probably won’t be one I go to opening weekend, but I plan on going. And since I am a Johnny fanatic, whether I love it or not, the movie will be added to my DVD collection. I’m sure other people feel the same way about various actors. Everyone has a time where their movies aren’t as strong as some of their others. A lot of actors play one good role in the beginning and are expected to live up to that in future. There are a LOT of factors that go into whether an actor is okay, good, or wonderful and the reason Johnny stands out to me so much is the fact that he is willing to push his limits and try so many different roles. Yes, Craig has made comments that Johnny plays different roles with the same accent, but honestly, how much can a person change their voice? He’s an actor more than a person trained in voice overs. Yes, several of his Burton movies have his characters looking pale and creepy, but that’s the Burton and actually, Johnny-style, given that Johnny typically creates his own character in the movies he plays in. But back to my point, he is willing to do just about anything that is thrown at him and he does it well, despite whether the movie itself is good or bad. I think I got off on a bit of a tangent there for a bit, but I think he did a good job as Barnabus Collins, even if the manuscript was a bit weak or too cheeky for some. 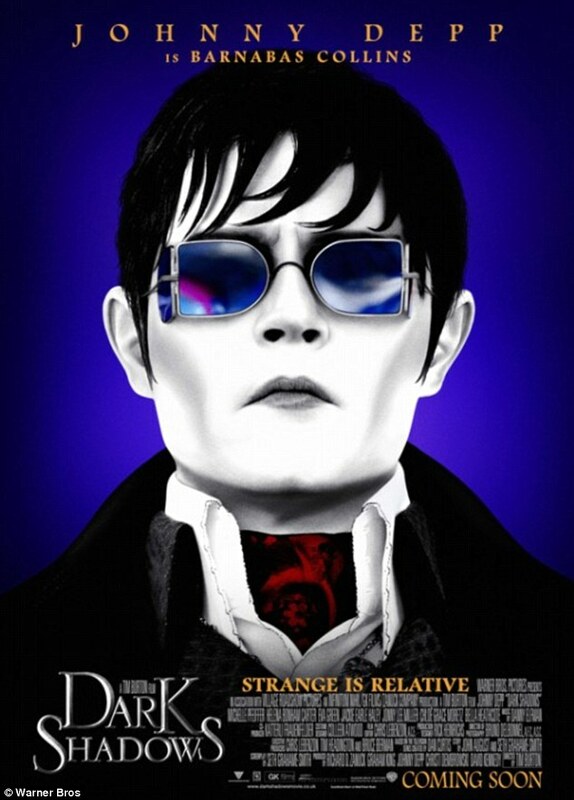 And if Burton & Depp were to have a 2nd Dark Shadows movie released next week, I’d be there again. That’s ’cause I AM a true Johnny Depp fan and quickly becoming a true Dark Shadows fan. I know that many Dark Shadows fans and people not familiar with the show think the movie “sucked balls” or whatnot, but I say… “to each their own”… if you don’t enjoy Burton’s style, don’t watch Burton movies. If you think Johnny’s past his prime and making sucky movies now, don’t watch movies he plays in. Don’t just go watch a movie because you want to have the pleasure of bitching about it later. If I were one to want to do that, I would’ve gone to see the rest of the Twilight saga, but I knew to stop after the first one as that was more than enough for me! Weird. Who in their right minds would expect a modern movie to resemble a television show from, what. 30 years ago? I am surprised any of those folks still go to movies! i thought it was okay, not great, and I hated that it was an obvious set-up for a sequel or franchise. i only watched it for Depp, though. i haven’t the slightest interest in the Dark Shadows backstory. I hear ya Scott. Many people can’t accept change even when there really is no other choice or any other direction to really go. But yeah, a show from the 60s & 70s can’t be expected to be the same so many years later.